This release has a couple of major changes to the disto list and the introduction of the Katana Tool Kit. The new version should be much more friendly for all the Windows users out there. The addition of the Katana Tool Kit should make using all the portable Windows apps much easier. Another key addition to Katana is a USB write blocker to prevent that pesky anti-virus from deleting some of the tools. Katana is also highly customizable. One of the major goals in the project was to develop an environment where users could tailor Katana to their needs. Users can customize Katana by adding and removing Distros and Portable Applications with relative ease. Added several new Windows tools inclusing GNUWin32, Forensic Acquisition Utilities, Angry IP and The Sleuth Kit. Changed the personal directory from "home" to "Documents". 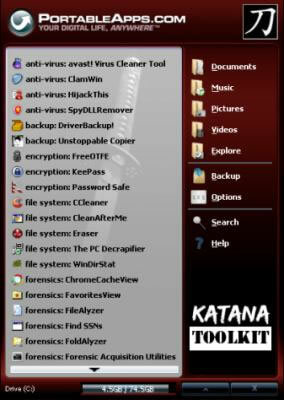 The Katana Tool Kit (KTK) is a suite of Windows applications which can be run of a USB Flash Drive. Without the need for installation on the base system, users can bring a suite of uncompromised tools with them anywhere. Tools like Wireshark, HiJackThis, Firefox, PuTTY, Unstoppable Copier, OllyDBG, ProcessActivityView, SniffPass Password Sniffer, ClamAV, Undelete Plus, IECookiesView, MozillaCacheView, FreeOTFE, The PC Decrapifier, FindSSN, The Sleuth Kit, and OpenOffice. The KTK facilitates fast access to all the Katana Windows applications. The applications are broken down into the following categories: Anti-Virus, Backup, Encryption, File System, Forensics, Media, Networking, Office, Recovery, Registry, System, Utilities. Each project provides unique functionality to the various categories listed above. See the full list of tools here. A USB write blocker application has been added to help prevent malware installing on the USB Flash Drive and to prevent the anti-virus from deleting any of the totally awesome apps from the Katana Tool Kit. By running the MakeUSBReadOnly.bat on mount, unmounting and remounting the drive, going about you business, and running MakeUSBWritable.bat after you are done, you can prevent most interference by applications on the base OS.